There is no doubt that the achievements of the club over the years have been recognised. All but three of the thirty selected have either played international football or were part of title or promotion winning teams at Turf Moor, and the exceptions were all iconic figures with one of them scoring arguably the club's most important goal. Our first ever international Jack Yates is there and he's joined in the pre-war group by FA Cup winning goalscorer Bert Freeman and three other stalwarts of that period either side of World War I, Jerry Dawson, Tommy Boyle and Bob Kelly. 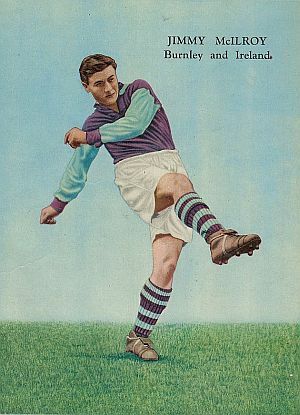 That early group is completed with George Beel who remains Burnley's all time leading goalscorer with 188 league and cup goals. The 1946/47 promotion team is represented by inside-forward Harry Potts who is alongside five of the 1960 Championship team he managed. I think it would have been a shock had Jimmy McIlroy not been included; he, not surprisingly, won more votes than any other player and will line up alongside his former team mates Jimmy Adamson, John Connelly, Ray Pointer and Burnley's finest ever servant Brian Miller. What a collection of players follow from the next era. Our greatest post-war goalscorer Willie Irvine will be featured alongside Ralph Coates and four players who were very much part of Adamson's Team of the Seventies. Those four are our last England international Martin Dobson, Welsh international Leighton James, Frank Casper and Peter Noble. Trevor Steven played only two seasons for our first team before signing for Everton as a 19-year-old, but Burnley fans saw what a talent he was and he has won a place in the fourth group alongside some very important goalscorers. He played alongside Billy Hamilton in the early 1980s and the pair of them are in a group with Ian Britton, scorer of that goal against Orient, Wembley goalscorers David Eyres and Gary Parkinson and finally Andy Payton whose goals twice kept us up in 1998 and 1999 before taking us up in the following season. That takes us to the final group from the 21st century and players we all remember. There had to be a place for Glen Little and he's won a place alongside five players who played in either or both of the teams that won promotion to the Premier League. From 2009 there is the little magician Robbie Blake, Wade Elliott, who scored the Wembley winner, and Graham Alexander. And linking those two teams is Michael Duff. To complete the group, we had to have one of our own. He's just recovered from a long term injury at his current club Southampton, but Jay Rodriguez, who figured in the 2009 promotion, will now be joined by all those mentioned above outside Turf Moor. That's it, the thirty players selected by the supporters. This idea initially came via the Clarets Mad message board when suggestions for improving Turf Moor were sought, and from there and the Burnley FC Supporters Groups a small group was set up to work with new chief executive David Baldwin. David said: "It's a great idea and will really improve the external image of the club. It's fantastic when the club and fans work together on a project for the good of all "
The next stage is to publish some mock up images before the end of September prior to the final work starting on producing the player boards ready to be placed on the stand walls.